Was Jamie Oliver’s recipe Gordon or Arnold? Why do we say Gordon Bennett as an exclamation of what? Disbelief. Well apparently as an expletive. The short version? Gor Blimey which is in itself, a version of God Blind me, thus adapted to take into account one Mr Bennett’s ‘famously outrageous lifestyle and newsworthy stunts’. (Source: The Phrase Finder.) This was the 1800’s. I wonder who’s lifestyle and stunts could inspire an expletive that someone is looking up in the year 2215? I think Kanye is a front runner. Beat some eggs in a bowl and add a little seasoning and half the parmesan. Heat a little oil and butter in a frying pan. Add the spring onions and cook until softened. Add the flaked fish then carefully pour over the eggs. Move everything around so it’s nice and even. 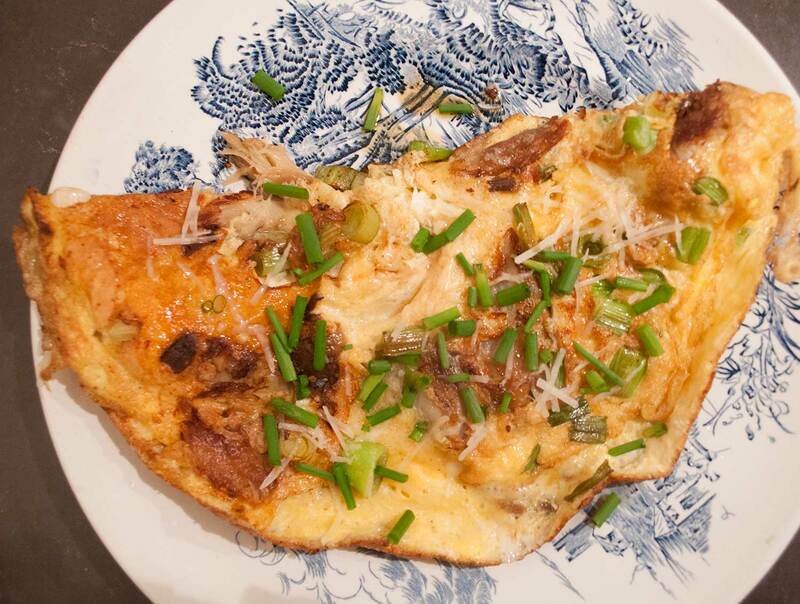 When the egg is cooked around the edges and turning opaque on top, your omelette is done. If you fold it over it will finish cooking on the inside. Sprinkle with parmesan and snip over some chives. After all that, I’m still no wiser as to why Jamie called his ‘gordon’, that’s why I’ve gone formal with my title but it was delicious so who cares? Love this post! The title made me think of Mr. Bennet, Lizzie’s Dad ! I was trying to figure how I’d missed an omelette recipe in Pride and Prejudice! Ha, thanks. Maybe it just didn’t register. I’m picturing Keira Knightley wolfing one down in the movie but I think I just made that up! Hi! All your dishes look very appetizing! Thank you Tammy. You have a very nice site yourself. I’ve been away from the blogging for a while but hope to start it up again in the new year.